Ethiopia, also known in the past by the name Abyssinia, has always been an independent nation, apart from a brief period from 1936 to 1942. The first known kingdom in Ethiopia is known to to have been established sometime about 800 BC and there have been a sucession of kingdoms since then. In the 19th century scramble for Africa it was the only African country to resist a European colonial power and retain its sovereignty. As part of an invasion the British established a field post office at Massawa (then a port of Ethiopia) in November 1867, using stamps of British India. The territory of Harar was taken by Egypt in 1875, and in the following year a post office was established; letters from there used Egyptian stamps canceled with a maltese cross. 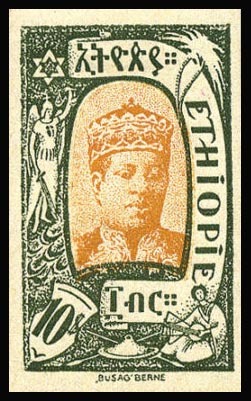 Ethiopia first issued postage stamps on 24 November 1894. These stamps were valid only for local mail and mail to Djibouti. 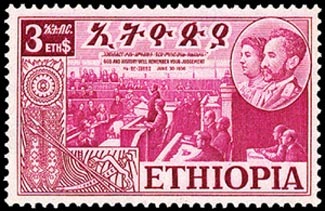 Prior to the admission of Ethiopia to the UPU in 1908, international mail from Ethiopia had to be additionally franked with stamps of UPU members. The mail was generally sent via Djibouti in French Somaliland. Italy invaded Ethiopia in 1895, the Italians were defeated and over 1,900 Italian troops were taken prisoner of war. They were held in captivity until a peace treaty was signed in Ocober 1896. Postal Stationery postcards were first issued in September 1896. This printing lasted till 1906 including overprinting in 1901, 1903 and 1905. French Post Offices operated in Ethiopia, in Addis Ababa, Harar and Dire Dawas, from 1906 and these were closed when Ethiopia joined the UPU on 1 November 1908. Ethiopia was annexed by Italy on 9 May 1936. In May 1936, Italy issued seven colonial stamps inscribed "ETIOPIA" and depicting Victor Emmanuel. Ethiopia was then incorporated in Italian East Africa with Eritrea and Italian Somaliland until the territory was liberated in 1941. The Emperor was restored in January 1942. In 1952 Eritrea was federated with Ethiopia. A coup d'etat on 12 September 1974 deposed Emperor Haile Selassie; the military took over the country and proclaimed a republic. The Ethiopian Philatelic Society (EPS) is a non-profit club with its membership open to anyone interested in collecting postage stamps, covers, and related material of Ethiopia. The major service to members is their medal-winning, 30-page or more quarterly bulletin titled Menelik's Journal. Comprehensive details about the stamps, postal stationery, postmarks, revenue stamps and officials of Ethopia. Link to the Synopsis only. To see the rest of the exhibit go to the Ethiopian Philatelic Society website where you find 6 other links, one for each frame. by Daryl Reiber Postage stamps, Air Mail, Cinderella, Express Mail and Metered Mail are covered on this website. Arthur Maury was a Paris stamp dealer who helped produce the Ethiopian 1895 issue and the 1896 postage dues then sold the remainders at a discount in 1900.
by Roberto Sciaky, published 1999 by Vaccari, 224 pages, 3 maps, 16 colour plates, over 200 black and white illustrations. by Ivan Ader, published by David Broberg, 1961.